The third team for the gubernatorial race is Tuika Tuika and running mate Iuni Maeva Saveena, a military retiree. It’s Tuika’s 4th attempt for the governorship and he’s not tired trying because he says there ‘s too much corruption in the government and someone with a clean record such as himself and his partner is needed to put an end to it once and for all. He boasts in an interview with KHJ News there’s nothing in the entire operation of the government he doesn’t know. Tuika was on the Fono staff before he became a faipule in 1985 and 1986. He was an accountant for ASG and says he was instrumental in the set up of the Territorial Audit Office under the Department of Treasury. He taught for 12 years including a stint at the American Samoa Community College. Tuika has also worked in the Tax Office. 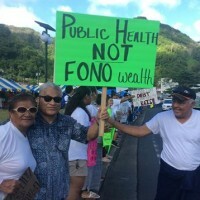 The candidate of governor is a former director of the the American Samoa Development Bank where he was a Board Director and DBAS Vice President. As President of a grassroots group, “Do the Right Thing,” organization Tuika had tried to bring down the Navy Federal Credit Union in response to dissatisfaction with existing commercial banks. Tuika explained they have already singled out a priority area to tackle if voters elect them. Tuika has pledged to expose all of the bank accounts for ASG in various countries. And he will make sure that all the accounts will be closed and the money repatriated to American Samoa. Tuika claimed that there are millions of dollars in the Vietnam banks and millions in neighboring Samoa as well as Las Vegas. And he has the documentation to prove the deception of the people by the past and current administrations. What he prides in their team is the fact that they have clean records in the government. Tuika pointed out the other two teams vying for governor and lt. governing including the current administration have been deeply involved in the corruption on this island. The team of Tuika and Saveena is also concerned with the status of the Retirement Fund and want to expose how actions by the current administration will negatively impact the Fund. Tuika says that what the people need right now are honest leaders and he believes their team is the one with a clean and honest record able to lead the territory. Tuika and Saveena have not set a date to officially kick off their campaign.